Both servers and restaurants have been on edge in the new year due to an IRS ruling that changed the classification of automatic gratuities from a tip to a wage. Now, automatic tips–such as the common 18% many restaurants charge for large parties—are categorized as wages rather than tips. These service charges now will be processed through the payroll system, which means servers will have to wait up to two weeks to receive their money. In addition, these wages are subject to additional taxes on the employee and employer fronts. The IRS ruling [Rev. Rul. 2012-18, 2012-26 I.R.B. 1032; Ann. 2012-25, 2012-26 I.R.B. 1054] went into effect in mid-2012, however food and beverage restaurants have had until January 1, 2014 to become in compliance. Revenue Ruling 2012-18 made it clear that some payments made by restaurant customers are, in fact, service charges that should not be treated as tips in computing the FICA credit and for other tax purposes. Instead, service charges that are distributed to employees should be treated as regular taxable wage payments. Now with the change in effect, many restaurants are reconsidering their policy of automatically adding gratuity for large parties. Automatically including a percent charge on a bill was originally designed to protect servers from being stiffed on large bills. Now, servers are feeling stiffed in another way by having to wait up to two weeks to receive their pay from such transactions. 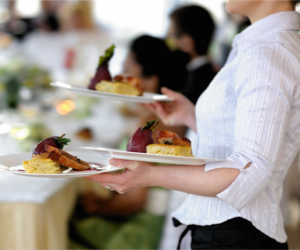 Most servers are paid an hourly wage much below the federal minimum wage of $7.25 and rely on tips to supplement their hourly wage. In light of the new regulation, many restaurants are considering listing on the bill suggested tips at 15%, 18%, and 20% of the total bill so that patrons can choose their own gratuity and restaurants can avoid running the additional amount through the payroll system. Still, some doubt the generosity of restaurant patrons to leave a tip at this level on a large bill. 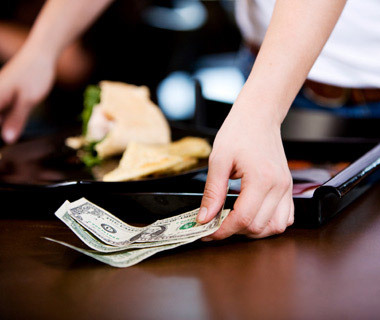 For the restaurants that stick with automatic tips, payroll will be more complicated because they will need to factor those tips into pay meaning hourly pay rates could vary day to day depending on how many large parties are served. So what taxes will the employees be subject to? As usual, restaurants must report to the IRS what its employees report receiving as tips and pay FICA taxes (Medicare and Social Security) on these amounts. Restaurants can receive an income-tax credit for some or all of these payments, but the service charges are not eligible for these credits. Cash tips including those charged to a credit card received by an employee are subject to federal income tax withholding. These tips are also subject to both the employee and employer portions of FICA. The employer’s income tax credit for FICA taxes paid on employees’ cash tips is equal to its share of FICA taxes paid on cash tips in excess of the tips used to meet its minimum wage obligations. For the credit, the employer’s minimum wage obligation is deemed to be $5.15 per hour, rather than the current federal minimum wage of $7.25. This article originally appeared on PaycheckCity.com.